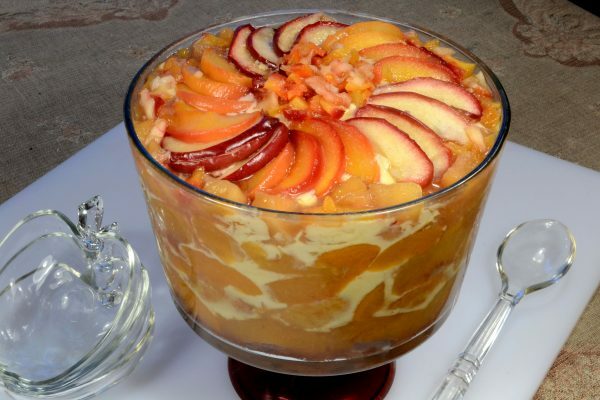 This year, spice up an old favorite with the Pumpkin Peach Trifle! Preheat oven to 350 degrees. In a medium large saucepan, combine fruit, sugar, cinnamon, salt and optional brandy. Simmer fruit until soft, about 10 minutes. Meanwhile, prepare cake mix as directed adding one cup of pumpkin to the cake batter, mixing well. Pour equally into three pie tins. (If using an 8-inch round instead of pie tins, slice cake into three layers when cooled.) If using tins, bake for about 15 minutes or until golden brown. If using 8-inch rounds, bake according to package instructions. Prepare pudding according to package instructions and set aside. To assemble, place first cake layer in a trifle bowl. Add a layer, (about ¾ inch thick) of fruit mixture. Spoon one third of the pudding on top of the fruit layer. Add second cake layer and repeat directions. Top with third cake layer and repeat process, ending with pudding. Decorate top of trifle with cooked slices of fruit, whipped cream or both. Refrigerate for at least one hour or overnight. Spoon into dessert bowls or parfait glasses. Serve with dollop of whipped cream. Serves approximately 8.